In this post, I have tried to explain the architecture of TCA in oracle apps using graphical representations and welcoming your comments. Hope it will be useful for my audience. 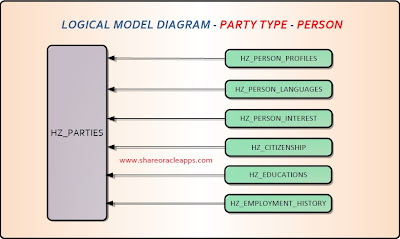 HZ_PARTIES : Stores information about parties. HZ_FINANCIAL_PROFILE : Stores information about the financial accounts. HZ_REFERENCES : Stores information about reference given by one party about another. HZ_CERTIFICATIONS : Stores information about the certifications given by other parties. HZ_PERSON_PROFILES : Stores details information about people. HZ_PERSON_INTEREST : Stores information about a person’s personal interests. HZ_ CITIZENSHIP : Stores information about a person’s claimed nationality. HZ_EDUCATIONS : Store information about a person educations. HZ_EMPLOYMENT_HISTORY : Stores information about where the person has been employed. 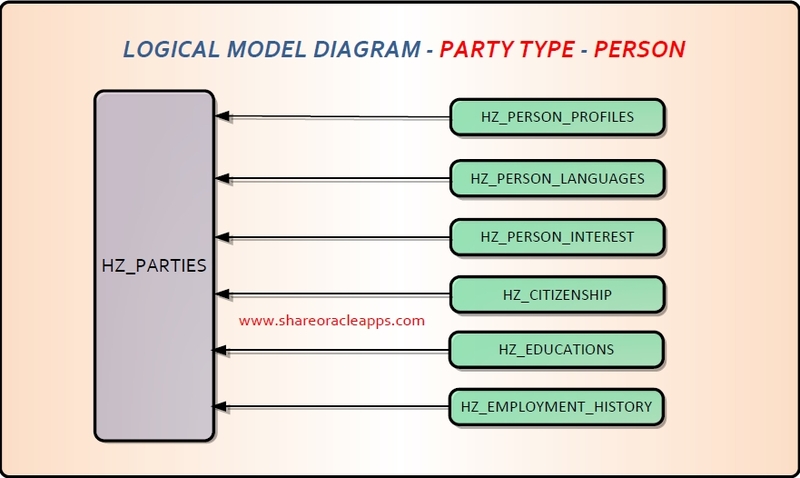 HZ_ORGANIZATION_PROFILES : Stores details information about credit rating, financial statistics, socio-economic and corporate linkage information. HZ_STOCK_MARKETS :Stores information about the selling and buying of financial instruments. HZ_SECURITY_ISSUED : Stores information about financial instruments such as stocks and bonds that has been issued by the organization. 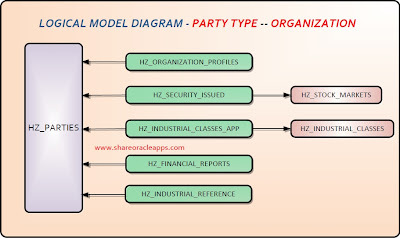 HZ_INDUSTRIAL_CLASS_APP : It is a intersection tables that link industrial classifications stores in HZ_INDUSTRIAL_CLASSES . HZ_INDUSTRIAL_CLASSES : Stores information about names and descriptions of industrial classifications. HZ_FINANCIAL_REPORTS : Store information details of financial reports that describe the financial status of the party. HZ_INDUSTRIAL_REFERENCE : Stores information about industrial reference for organization. 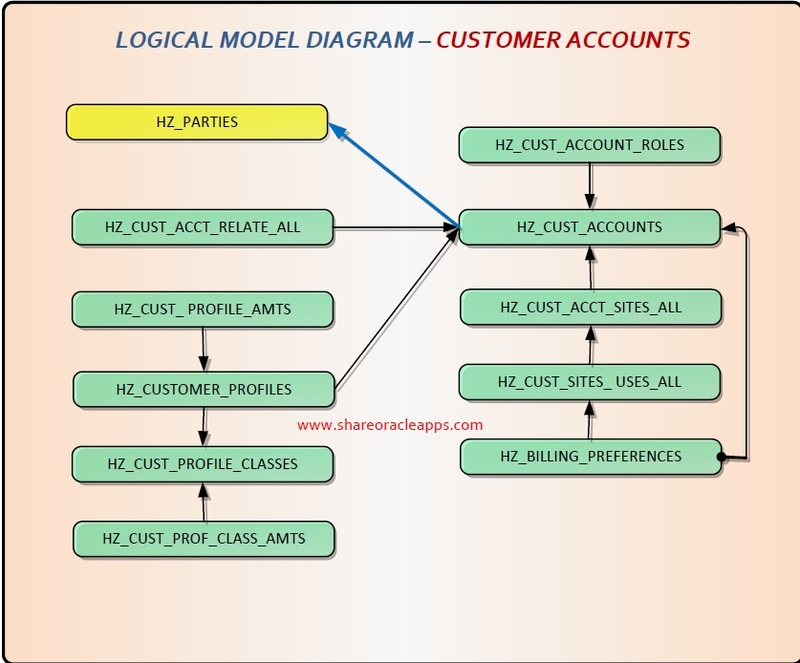 HZ_CUST_ACCOUNTS : Stores information about the relationship, if a party becomes a customer. Basically stores information about customer accounts. HZ_CUST_ACCT_SITES_ALL : Stores information about customer sites. One customer can have more then multiple sites. HZ_CUST_SITE_USES_ALL : Stores information about site uses or business purpose. A Single customer site can have multiple sites uses such as Bill To or Ship To. 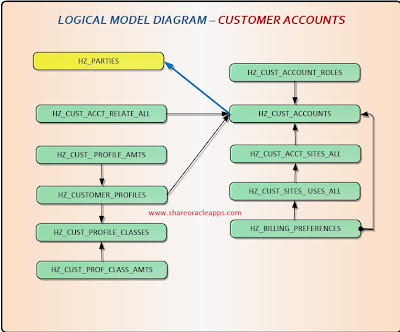 HZ_CUST_ACCT_RELATE_ALL : Stores information about relationships between customer accounts. 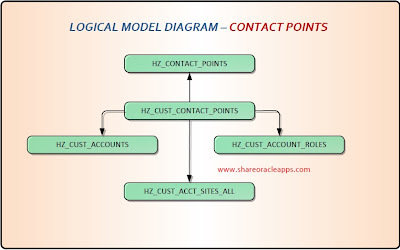 HZ_CUST_ACCOUNT_ROLES : Stores information about the roles that parties perform in customer accounts. HZ_BILLING_PREFERENCES : It describe the invoicing format preferred by customer accounts or customer account sites. HZ_CUSTOMER_PROFILES : Stores credit information for a customer account and customer account sites. HZ_CUST_PROFILE_AMTS : Stores profile amount limits for every currency defined for a customer account or customer account site profile. HZ_CUST_PROF_CLASS_AMTS :Stores customer profile class amount limits for currency. HZ_CUST_PROFILE_CLASSES : Stores standard credit profile classes. HZ_CONTACT_POINTS : Stores electronic methods of communicating with entities such as parties, party site. Each record in this table represents s different means of contacting an entity. HZ_CUST_CONTACT_POINTS : This table is used to tie a contact point to a customer account, customer account site or customer account role. HZ_CONTACT_RESTRICTIONS : It stores information about restrictions on contacting parties. HZ_PARTIES_SITES : Stores information about parties and locations. Because there is a many-to-many relationship between parties and locations. 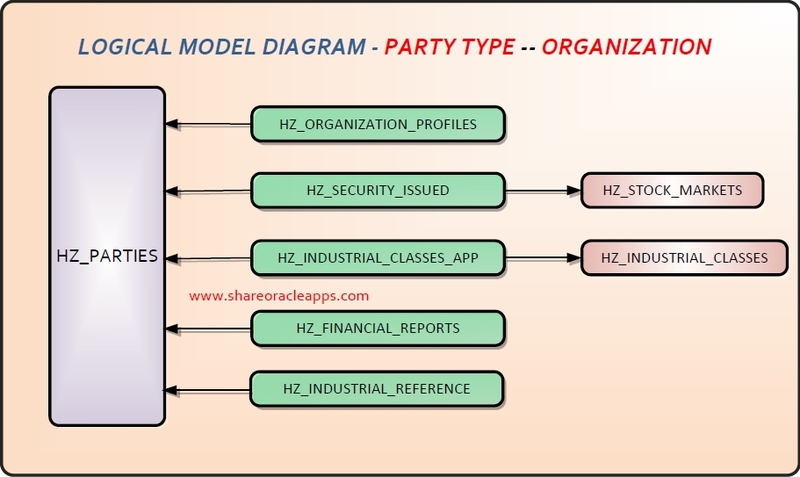 HZ_PARTIES_SITE_USES : Stores information about the party site uses and business purposes. A party site can have multiple site uses such as ‘bill to’ or ‘ship to’ and each site is stores as a record in this table.